Are you a huge fan of task cards, too? I believe it was about 4 years ago when I was introduced to them. I was coteaching in a 3rd grade classroom, and when I stepped into that classroom one day, I observed kids scattered throughout the room, each quietly working with a laminated card of some sort. I was so impressed at how engaged each student was with his or her card. I quickly learned that students were reading the card, performing the task (making inferences was the focus skill for this set, so students were reading a short passage and then answering an inference question), and then recording their answer on another full sheet of paper. When they were finished with the card, they moved on to another card that they hadn't yet completed. From that day forward, I was hooked! 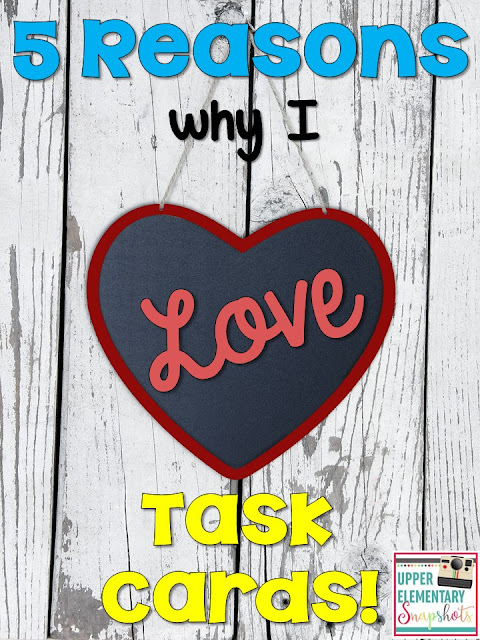 I love task cards for so many reasons, but this brief list touches on my top 5 reasons for using them regularly with students. 1. They are more engaging than worksheets. Glancing at a worksheet full of passages or problems can be intimidating. With task cards, there is usually just one item to answer on each card, which is much less overwhelming to some of our students! Furthermore, task cards are often more colorful than worksheets. 2. They are versatile. I usually use the entire set at once, but I have been known to also use isolated task cards for exit tickets and bellringers, to grab one and read it to my students as they are standing in line, or even as Test Prep Jeopardy questions! 3. They get students up and moving. 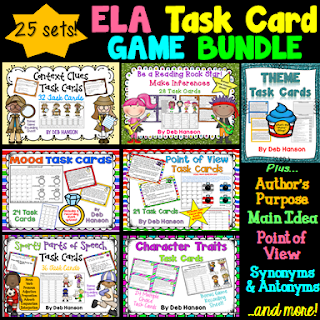 When using the entire set, I like to spread the cards across the classroom, and have students move from card to card until they have completed all of the task cards. We all know how beneficial it can be to allow students to leave their seats and start moving! 4. They make valuable formative assessments. Occasionally, I assign only the even-numbered cards. When students are done, I glance through the recording sheets and jot down which students really seemed to struggle with determining the correct answer independently. This information tells me who I need to work with in small groups, and I use the odd-numbered cards with that small group of students. 5. They allow for differentiation. There are so many options for differentiation. You can have students work with a partner, students can work at their own pace, or you can shorten the assignment for some students. One of the first times I used a set of task cards with a group of 5th graders, we corrected them together. When we finished discussing the answers, one of the boys announced in a matter-of-fact voice, "it looks like the B's won." My first reaction was this thought: Must you be so competitive? Not a second later, though, I realized, Hey! I think he's on to something! I should try to create an answer sheet that is set up to see which letter "wins"! 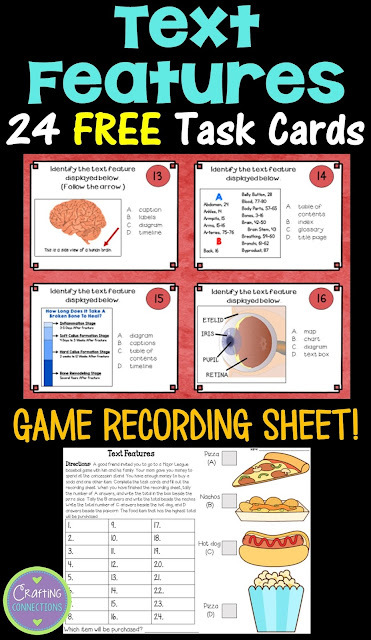 Would you like to see additional task card sets with these types of answer sheets? Just click here or check out my bundle!